The Woody Series Axe III features the exact specs of the Ultimate carbon fiber version but in extra affordable all maple construction. Order your WOODY AXE III ready to race out of the box. Fully loaded with select quality components -- the Woody Axe III complete comes expertly built and tweeked for performance to suit the rider and intended discipline. 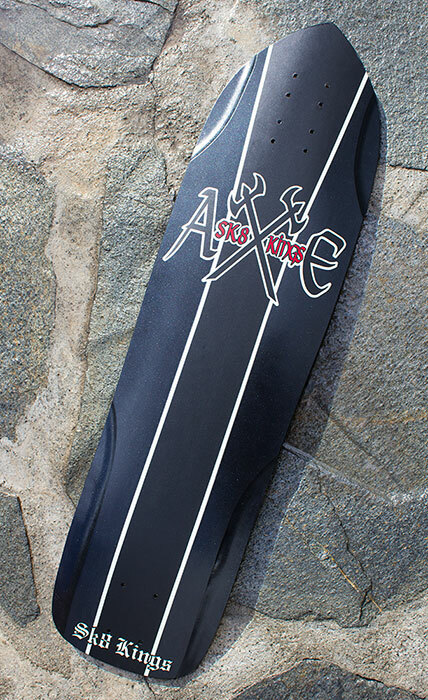 Our Axe decks are your #1 choice for slalom racing, freeriding, long distance pumping - and can also be set up as a street cruiser by moving the truck location in rear and adding a tail skid plate. The Axe III is sized-up for stable turning at speed and is ideal for hybrid and giant slalom with adjustable wheelbase options. 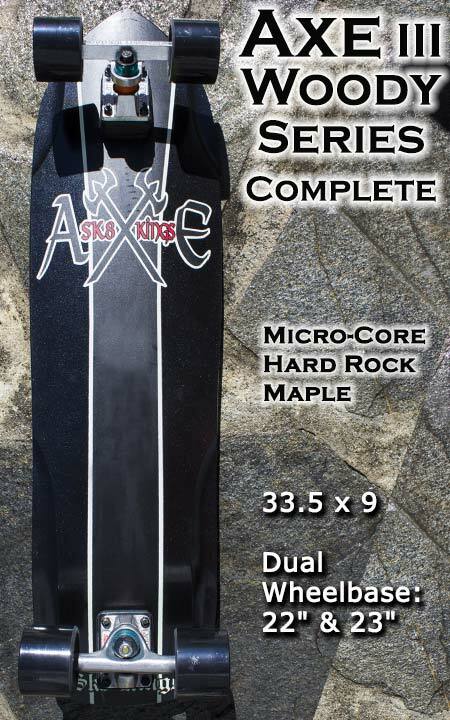 Not just for slalom racing -- this complete can be configured to function great for non-racng too -- max fun for carving/cruising, ditches or just longboarding around town. Let us know what you want to do with it and we'll work it out. OPTIONAL UPGRADES: High Performance Trucks: Choose from the list at checkout to upgrade for the ultimate set-up to suit your budget. Wheels: Choose from the list at checkout to upgrade wheels & make special durometer requests in the "NOTES" section if needed. Premium Bushings: Upgrade to premium grade custom bushing combos all around. Alternative Bushing Combo: To make your setup even more versatile -- choose this upgrade to receive an additional bushing combo for your trucks to suit the opposite discipline. Just pop the other combo in your trucks, adjust your wheelbase and you're ready to go. Back-up Bushings: Bushings are essential for top performance. Order backup sets for your trucks and be ready when you need to be. Choose "premium" for this upgrade if you have also upgraded to premium bushings. Bearing Upgrade: Choose from the list at checkout to upgrade for the ultimate set-up to suit your budget. Oust Bearing Maintenance Bundle: Includes one bottle of Oust Metol Speed Lube and one Oust Speed Kleen Bearing Wash Kit at a special bundle price savings. Remove dirt and buildup from bearings with the Kleen Kit and relube with Metol Speed lube. Choose upgrades when ordering -- additional charges apply. Custom Stripe Grip Top --available. 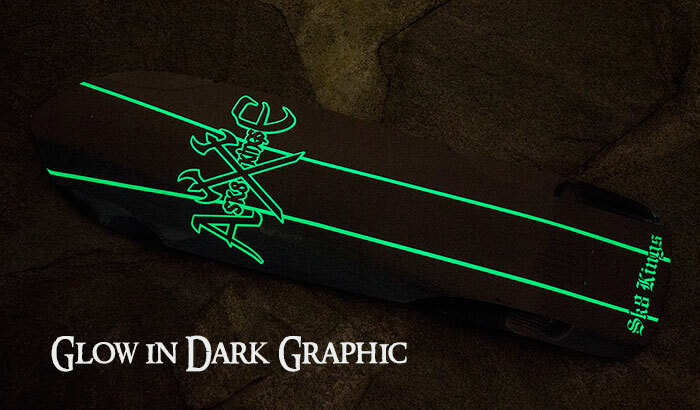 Choose from Glow in the Dark stripe or Red & Black stripe when ordering.